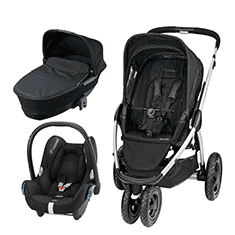 The innovative One plus One system transforms the Wave from a single travel system to a double without the need for an extra purchase. Aluminium and magnesium alloy chassis for strength and a four-way independent wheel chassis with puncture proof tyres. This parasol from Silver Cross Wave is the smart and stylish way to offer extra sun protection for your baby on those hot and sunny days. The parasol clicks on and off with a simple push button mechanism. The stem has a strong, flexible base that allows you to move your parasol into any position and the easy-release mechanism lets you take it down quickly and easily.